Urban trees experience a virtual litany of environmental insults such as increased heat loads, de-icing salts, soil and air pollution and interference from utilities, vehicles and buildings (Bassuk and Whitlow, 1985; Craul, 1992). Yet the most significant problem that urban trees face is the scarce quantity of useable soil for root growth (Lindsey and Bassuk, 1992). A large volume of uncompacted soil, with adequate drainage, aeration, and reasonable fertility, is the key to the healthy growth of trees (Perry, 1982; Craul, 1992). The investment in soil for a healthy tree is paid back by fulfilling the functions for which it was planted. These functions may include shade, beauty, noise reduction, wind abatement, pollution reduction, stormwater mitigation, wildlife habitat and the creation of civic identity. An adequate soil volume is key considering soils are where nutrients, water and air are held in a balance that allows for root growth, water and nutrient acquisition. Simply put, when soils are inadequate, plant growth suffers and trees die prematurely. As the macro pores are crushed, soils become denser, eventually posing a physical barrier to root penetration. There are numerous accounts of urban soils being literally as “dense as bricks” (Patterson, 1980). One method of evaluating relative compactness, or the severity of soil compaction, is to measure the soil’s weight per volume, or its density. This measurement is communicated either by bulk density or by dry density. Dry density is the dry weight of soil per a given volume, often expressed as grams dry weight/cm³ (g/cm³ or Mg/m³). Soils, depending on their texture, become limiting to root growth when their dry density approaches 1.4 g cubic cm for clayey soils to 1.7 g cubic cm for sandy soils (Morris and Lowry, 1988). When roots encounter a soil so dense that they cannot penetrate it, the roots may change direction if that is possible, or be stopped from growing altogether. 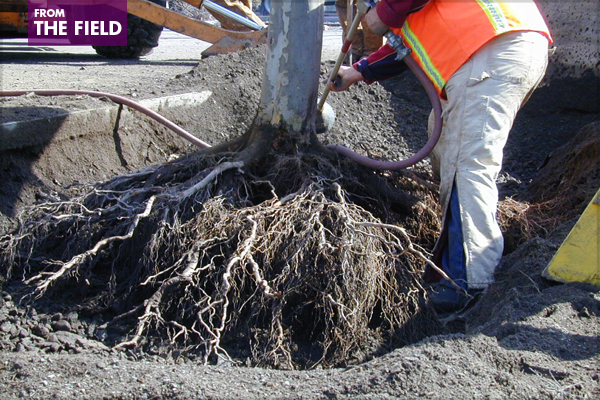 Very often in the urban environment, roots coming out of a newly planted root ball into compacted soil will grow from a depth of 12 or 18 inches upwards where they remain just below the surface. This superficial rooting tends to make urban trees more sensitive to drought as soils dry out in the summer (Bassuk and Whitlow, 1985). Conversely, when a tree is planted into compacted soil and drainage is impeded through the crushing of soil macro pores, water may remain around the root zone depriving the roots of needed oxygen. This can lead to root death and an impaired ability to take up water and nutrients that are necessary for tree growth. In urban soils that are not covered by pavement, it is possible to cultivate, amend or replace compacted soils to make them more conducive to root growth. However, where soils are covered by pavement, the needs of the tree come in direct opposition to specifications that call for a highly compacted base on which to lay pavement. All pavements must be laid on well-draining compacted bases so that the pavement will not subside, frost heave, or otherwise prematurely require replacement. In order to create predictably compacted base course materials, a test that is typically used called ‘Proctor density’ or ‘peak density’ assures that the base below the pavement is compacted sufficiently to meet the wear that it will receive. For any type of soil or aggregate, Proctor density is defined by ASTM D 698-91 method D protocol. The soil type to be used is tested with the same amount of compactive effort, 56 blows from a 5.5 pound hammer free-falling 12 inches for each 3 layers in a 6 inch diameter mold of 4.6 inch depth, at different moisture content. As the soil moisture content increases, the standard Proctor effort will result in a higher soil dry density as water in the soil acts as a lubricant, allowing soil particles to pack and nest closer to one another. The end result is an increase in dry density, or dry-weight per volume, of the sample. Eventually, there will come a moisture level where the water in the soil actually holds the soil solids apart, resulting in a lower dry density after the standardized compaction effort. This relationship of soil dry density resultant from a standardized compact effort, over a range of moisture contents, can be graphed as a moisture-density curve. 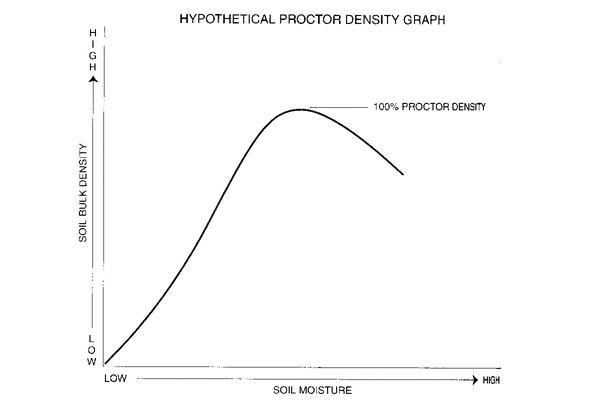 The maximum estimated dry density from the moisture-density curve is defined as 100% Proctor density (see graph below). The actual dry density at 100% Proctor will vary depending on soil texture or stone aggregate size distribution. In the field, it is often required that soils or bases under pavement be compacted to within 95% Proctor density. This means that soils are at dry densities greater than 1.8 or 1.9 g cm³. Thus, soils that must support pavement are often too dense for root growth. It is not surprising then that urban trees surrounded by pavement have the shortest life span in cities (Moll, 1989 Craul, 1992). These paved areas also tend to be those that need trees the most to mitigate the heat island microclimate that exist in downtown areas. Proctor Density Graph. As soil moisture increases, the same compactive force will result in a greater soil density. When soil moisture increases to a point where soil particles are held apart, soil density rapidly decreases. The point before excess soil moisture causes a reduction in density is termed 100% Proctor Density. How much soil does a tree need? If it is recognized that urban trees are desired and necessary to the health and livability of our cities, how much useable soil is necessary to allow them to fulfill their design functions? Research at Cornell’s Urban Horticulture Institute (UHI) has shown that a reasonable ‘rule of thumb’ for most of the United States, except for the desert southwest, is to plan for two cubic feet of soil per every square foot of crown projection. The crown projection is the area under the drip line of the tree (Lindsey and Bassuk, 1992). If the tree canopy is viewed as symmetrical, the crown projection can be calculated as the area of a circle (Pi x radius squared). For example: for a tree with a canopy diameter of 20 feet, the crown projection would be, 3.14 (10 squared), or 3.14 (100) = 314 square feet. Using the ‘rule of thumb,’ an estimate can be calculated that the tree needs approximately 600 cubic feet of soil to support it. Assuming a useable rooting depth of 3 feet, one way of dimensioning the space needed for this tree would be 20′ x 10′ x 3′, or 600 cubic feet. 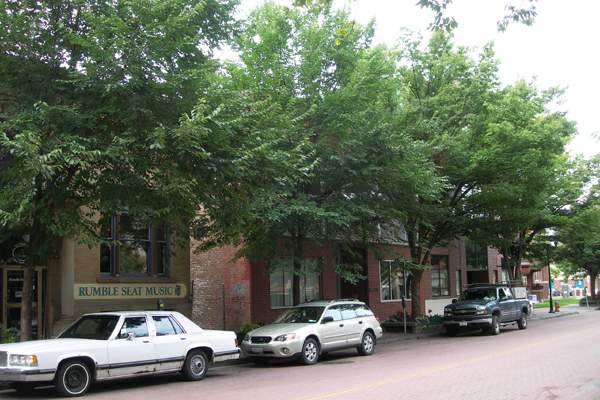 It is clear that the typical 4′ x 5′ tree opening in the sidewalks, or the 6′ x 6′ tree pit, is inadequate to allow the tree to fulfill its function in the landscape. Where can one find enough soil? Under the sidewalk there is a potential for a large volume of soil that would be adequate to allow trees to reach their ‘design size’ as long as the soil volume for each tree was connected and continuous, giving each tree a chance to share soil with its neighboring tree. Looking at the forest as a model, trees may be spaced reasonably close together as long as they share a large common soil volume to support their needs. Therefore, the task is to find a soil that meets a pavements design requirements while simultaneously allowing for unimpeded root growth under the pavement. To do this, the authors envisioned a gap graded soil system that could be compacted to 100% Proctor density while still allowing roots to grow through it. The primary component of this soil system is a uniformly sized, highly angular crushed stone or crushed gravel ranging from 3/4 to 1 1/2 inches in diameter with no fine materials. If this single-sized stone is compacted, the stones would form an open stone structure with about a 40 percent porosity. For a similar single-sized spherical stone, a structure with 33 percent porosity would be produced. Friction between the stones at contact points would “lock in” forming the load-bearing structure of the mixture. The second component of this mixture is a soil which fills the stone voids. As long as we do not prevent the stone structure from forming by adding too much soil, the soil in the voids will remain largely non-compacted and root penetrable. Bassuk, N. L. and T. H. Whitlow. “Evaluating street tree microclimates in New York City.” Proc. 5th METRIA Conference (May 1985): 18-27. Craul, P. J. Urban Soil in Landscape Design. New York: John Wiley & Sons, Inc., 1992. Grabosky, J. Identification and testing of load bearing media to accommodate sustained root growth in urban street tree plantings. M.S. Thesis, Cornell University, 1995. Grabosky, Jason, Edward Haffner, and Nina Bassuk. “Plant Available Moisture in Stone-soil Media for Use Under Pavement While Allowing Urban Tree Root Growth.” Arboriculture & Urban Forestry 35, no. 5 (2009): 271-278. Lindsey, P. and N. Bassuk. “Redesigning the urban forest from the ground below: A new approach to specifying adequate soil volumes for street trees.” Arboricultural Journal 16 (1992): 25-39. Moll, G. “The State of our Urban Forests.” American Forests, November/December 1989. Morris, L.A., and R.F. Lowry. “Influence of Site Preparation on Soil Conditions Affecting Stand Establishment and Tree Growth.” Southern Journal of Applied Forestry 12, no. 3 (1988): 170-178. Patterson, J. C., J. J. Murray, and J. R. Short. “The impact of urban soils on vegetation.” Proc. 3rd METRIA Conference (1980): 33-56. Perry, T. O. “The ecology of tree roots and the practical significance thereof.” Arboricultural Journal 8 (1982): 197-211. Thank you for this informative article. Caroline Stalite makes an expanded slate horticultural media known as “PermaTill” that I have specified for urban streetscapes, bioretention facilities, trickle gardens, perimeter landscape areas around parking lots, interior parking lot tree pits, living green roofs, and container gardens as well as for amendment of tight clay soils in ‘postage stamp’-size town home/condo gardens with great success. Projects have included installations of specimen-size trees that quickly established strong root structures and continue to thrive in the media several years later. Additional information and research data about this horticultural media that also functions as structural media under sidewalks and pavements is available at http://www.permatill.com. Excellent essential practice information! LARE candidates seeking basic knowledge and skill for success on the minimum standard exam to become licensed now have a concise overview. Professionals in practice have a nice white paper for client and permit agency conversations about deploying water conservation strategies. Thank you for writing this article – looking forward to Part II. Hard fact is Great majority of nursery stock arrives already too deep in rootball. And installing rootballs several inches higher neither corrects for buried rootflare nor rescues rootballs lower rootsystem from oxygenless compacted soil conditions. Building soil dyke and mulch ring around base of new trees…literally worst horticultural engineering disaster to ever embarrass noble trade. Remember boys & girls, never raise grade over trees roots. Plant at sea grade, and mulching flat where its at. An Arborist like me who determines technical reasons resulting in each trees terminated service life. Parkway soil conditions rarely reasons why urban trees decline, except for lesser species like maple & linden suffering from extended drought. 7 out of 10 urban trees suffer evidence seen in stump rings revealing trunk constriction before age 6 during some stage in nursery. When you see surface roots, you found compacted soil. As roots step over to get elsewhere. In past America’s superior urban thriving Elms & Ashes grew in anything. Boy we really screwed that up.